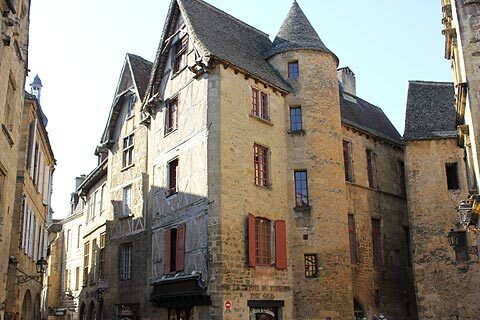 Sarlat is at the very heart of the Dordogne area and as well as being in itself a highpoint of a trip to the Dordogne there is lots to do in the surrounding area. Sarlat and many of the local villages date back to medieval times and a trip here really is like stepping back in time. Here is an insider's guide as to what to do with a day to spend in the Dordogne in the area in and around Sarlat. 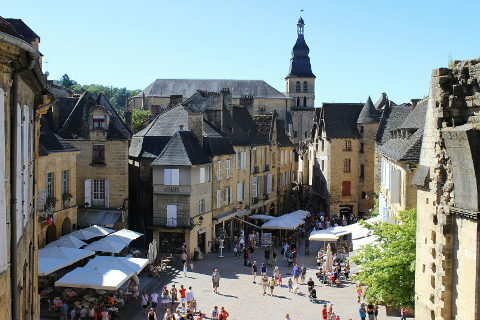 Start your trip with a visit to the medieval town of Sarlat. This is without doubt one of the most attractive towns in France. It has a mix of medieval and Renaissance architecture and has been beautifully restored. Set off down the pedestrianised Rue de la Republique making frequent excursions into the narrow cobbled streets on either side. Be sure not to miss the cathedral, the Hotel de la Boetie and the Manoir de Gisson, opened recently to the public. Whilst exploring the narrow medieval streets there are an abundance of shops selling local products including the local speciality Foie Gras. As a pate the paté de Foie Gras is delicious but if you get the chance have a meal based on lightly fried Foie Gras - Foie Gras poelé - often served with pear, apple or rhubarb; a heavenly combination. Sarlat also has a number of delicious nougat shops. A great treat for adults and children alike. Often you can taste the different flavours in order to select your favourite. One option is to make yourself a splendid picnic of crusty french bread and a pot of paté de foie gras with a salad from the covered market which is open every day or from the weekly markets which take place on Saturday and Wednesday mornings. If you prefer to go to a restaurant there are literally dozens and many offer good quality local dishes. If you want to treat yourself then try 'Le Grand Bleu' on Avenue de la Gare. This Michelin starred restaurant continues to offer imaginative and great tasting food. After a relatively lazy morning and an enjoyable lunch its time to increase the pace a little and visit some of the wonderful medieval villages of the Dordogne valley. Three of France's "most beautiful villages" are side by side along the river. These are La Roque Gageac, Castelnaud-la-Chappelle and Beynac. La Roque Gageac is a charming village on the edge of the Dordogne river. Its golden stone houses wind gently up the hillside and the narrow cobbled streets are lined with exotic plants such as bananas, palms and bamboo. Above the village the cliff face looms up providing a dramatic backdrop. 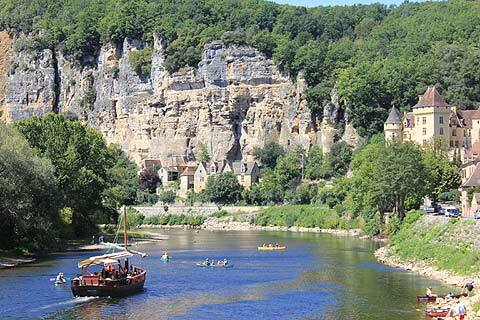 If you fancy a trip along the river in one of the Gabarres, which are boats built in the traditional style, then you can join these 50/55 minute trips at La Roque-Gageac or Beynac. Both offer a delightful way to see the castles and villages along this stretch of the river. Continuing along the river Castelnaud-la-Chappelle is another beautiful village. Castelnaud winds up to the imposing castle which dominates the village and is well worth visiting. It is one of the most visited castles in the Dordogne. It is a splendid 12th century castle displaying the traditional defensive features of medieval castles. It also offers great views over the river towards Chateau de Beynac on the opposite bank. On the opposite bank of the river Beynac is another beautiful village built on the rivers edge. Narrow cobbled streets, lined with medieval houses built in golden stone with terracotta tiled roofs, lead you up towards the imposing Chateau de Beynac at the top. Another chateau well worth visiting to get an idea of life in medieval times. The streets leading up to the chateau contain a number of interesting boutiques selling a variety of things. One of our favourites is the lovely enamel jewellery boutique. All three of these villages offer plenty of cafés, bars, ice-cream shops etc to allow you to take a pause and savour the atmosphere whilst having a drink or a snack. The Chateau des Milandes - once home to the famous Josephine Baker is very close to Beynac and Castelnaud but this castle was built for living in rather than for war. It is a delightful chateau and exhibits from Josephine Baker's life are an added bonus. 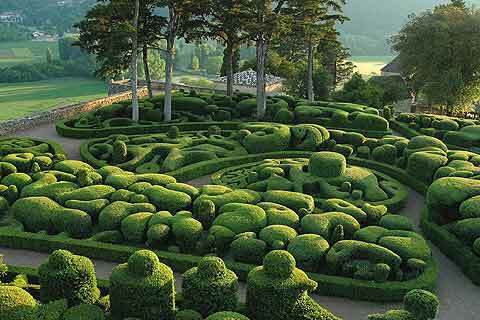 The 'Jardins de Marqueyssac' are great to visit whether you are a garden enthusiast or not. As well as some amazing swirling cut box hedges the gardens sit high above the Dordogne and a walk through the wooded parts of the garden offers some great views of the river below. There is a restaurant here and a tea-room allowing you to stop here for refreshments. Domme is another "most beautiful village" of France and this is close to La Roque Gageac. Domme has a beautiful medieval centre and beautiful views over the dordogne valley as it is raised high above the river. There is also a cave system right under the centre of the village which is open to visitors. Garden enthusiasts will enjoy a visit to the pretty gardens of the Clos des Sources near to the village of Vitrac. These are informal gardens in a lovely valley setting. If you have children then the Chateau de Castelnaud should be high on your list. This is a magnificent castle but also has displays of ancient weapons, reconstructions of some of the large medieval weaponry used for attacking castles. The 'Jardins de Marqueyssac' are excellent gardens to visit with children as much of the gardens are a shady walk through woods where children can safely run around and there is a small play area and a picnic area as well as a café where you can buy refreshments. If the weather is nice then you can take a half-day canoe trip along the river and see the villages from the vantage point of the river. You can pull your canoe in to the edge and stop to admire the villages from close up. If you decide to stop to explore the villages on foot its probably best to leave someone keeping an eye on the canoe! If its raining you can spend time indoors visiting the castles of Castelnaud, Beynac or Les Milandes. In Sarlat you can visit the Maison de Gisson and there are enough little boutiques to keep you out of the rain for a lot of your visit. 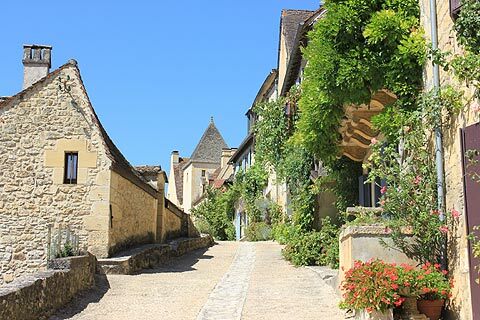 Also take the opportunity to linger over a nice lunch or a coffee in one of the lovely restaurants or cafés in Sarlat or one of the Dordogne villages. Everybody visiting the Dordogne should visit at least one of the prehistoric sites for which this area is famous throughout the world. Take a look at our suggestions for a day in prehistoric Dordogne, focused around Les Eyzies and the Vezere valley.